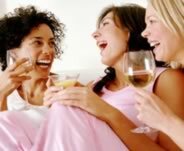 Why not invite a few friends around for a girls night in and maybe a glass of wine or two? A minimum of 6 people required for pamper parties. You may choose to have 2 treatments if you wish (time allowing). The hostess receives her treatment free of charge.